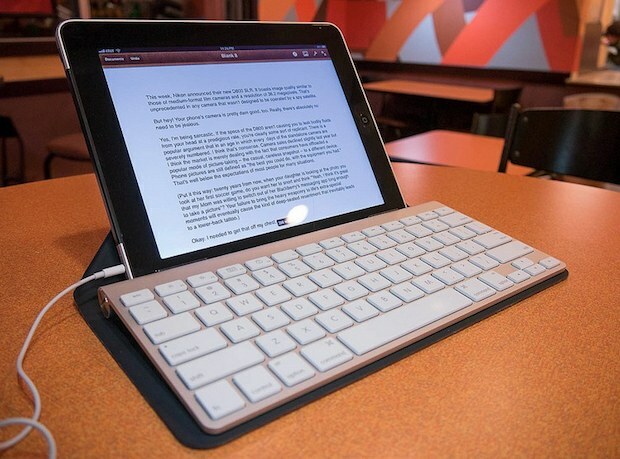 Did you know you can navigate around the iPad using only a keyboard, without touching the screen at all? It’s part of iOS Accessibility options, and using keyboard navigation makes the iPad feel a lot more like a traditional computer, even sharing some of the keyboard shortcuts that Macs have to do things like the ever useful Command+Tab app switcher. This is a very underused and little-known feature of iOS, but it can really improve and speed up workflow on the iPad for those who use external keyboards with the device. With VoiceOver enabled you will gain access to the keyboard navigation feature, but there’s also a potentially annoying speaking aspect that comes with VoiceOver, just hit Control+Option+S to silence that. Now for the commands. These keyboard shortcuts can be used from anywhere. You’ll notice many of them are shared between OS X and iOS, making them familiar and quite easy to use for Mac users who are using the iPad. These shortcuts speed up multitasking in iOS so much that they should be considered mandatory knowledge for anyone trying to do serious work on the iPad with an external keyboard. Memorize and master these and you’re sure to be more productive. Whether you have a keyboard dock, case, or just a bluetooth keyboard, check these out, they can completely change the way you use an iPad. Can anyone confirm if this works with the iPhone too? I just tried this out on my iPhone 5 tonight and yes these features do work! Its actually really cool. There is a bit of a learning curve and a tonne of shortcuts to learn but once you get going with it its great. I couldn’t however get the command-tab feature mentioned above to work so I am thinking that its iPad specific or I am missing something. I tried on both an Apple Wireless Keyboard and a Logitech bluetooth keyboard and both worked. Great tip! Thanks OSX Daily!!! Some sort of feminine hygene product? Billy, don’t mention the brand again..
I’ve told u…that is my monthly feminine product. Don’t let other people know about it. Thankyou so much! This is so much more convenient for me. Didn’t work for me. . . Setting up VoiceOver just stops me getting back to this page to see which commands now work. Frustrating. The feature seems to be intended for visually impaired people. The experience using this feature with background music turned on is really terrible. The problem with going to voice over mode is that everything now needs a double click. How do you avoid that? How can i use the tab option to navigate through text filed example if I am using whatsapp or such like, and I want to type a text and send it for example. I’m new to Bluetooth keyboards am wondering how to navigate around within apps on iPhone 6 plus – I.e., what key combo is same as double tapping to select? any cases, I‘ll try to do it later!